Objective: To assess the effect of multidisciplinary biopsychosocial rehabilitation on clinically relevant outcomes in patients with chronic low back pain. Design: Systematic literature review of randomised controlled trials. Participants: A total of 1964 patients with disabling low back pain for more than three months. Main outcome measures: Pain, function, employment, quality of life, and global assessments. Results: Ten trials reported on a total of 12 randomised comparisons of multidisciplinary treatment and a control condition. There was strong evidence that intensive multidisciplinary biopsychosocial rehabilitation with functional restoration improves function when compared with inpatient or outpatient non-multidisciplinary treatments. There was moderate evidence that intensive multidisciplinary biopsychosocial rehabilitation with functional restoration reduces pain when compared with outpatient non-multidisciplinary rehabilitation or usual care. There was contradictory evidence regarding vocational outcomes of intensive multidisciplinary biopsychosocial intervention. Some trials reported improvements in work readiness, but others showed no significant reduction in sickness leaves. Less intensive outpatient psychophysical treatments did not improve pain, function, or vocational outcomes when compared with non-multidisciplinary outpatient therapy or usual care. Few trials reported effects on quality of life or global assessments. Conclusions: The reviewed trials provide evidence that intensive multidisciplinary biopsychosocial rehabilitation with functional restoration reduces pain and improves function in patients with chronic low back pain. Less intensive interventions did not show improvements in clinically relevant outcomes. Multidisciplinary treatments for chronic pain have been evaluated in many non-randomised studies and non-systematic reviews; both are prone to bias.5 We are aware of two published systematic reviews on this topic. Flor et al reviewed 65 controlled and non-controlled studies available in 1990.6 They calculated overall effect sizes within and between groups. They concluded that multidisciplinary treatments were effective, although the methodological quality of the studies was marginal. Cutler et al combined studies of multidisciplinary treatments and of other non-surgical treatments—a total of 37 controlled and non-controlled studies.7 They concluded that non-surgical treatment of chronic pain does enable patients to return to work. Estimating treatment effects in the absence of a control group and pooling together controlled and non-controlled studies implies a high risk of bias. Furthermore, these systematic reviews included no randomised controlled trials. We aimed to assess systematically, based on available randomised controlled trials, the effect of multidisciplinary biopsychosocial rehabilitation on clinically relevant outcomes in patients with chronic low back pain. To be included, a study had to fulfil several criteria. Participants had to be adults with disabling low back pain for more than three months (with or without sciatica). One group of participants had to have received multidisciplinary biopsychosocial rehabilitation; a minimum of the physical dimension and one of the other dimensions (psychological or social or occupational) had to be present as defined in the protocol.9 One group of participants had to have received a control treatment that did not fulfil our criteria for multidisciplinary rehabilitation. The study had to report treatment effect in at least one of these variables: pain severity, global improvement, functional status, quality of life, and employment status. Interventions described as back schools were excluded, unless they were part of a programme that fulfilled our criteria for multidisciplinary biopsychosocial rehabilitation. We used three strategies to locate candidate randomised controlled trials: an electronic database search (using Medline, Embase, PsycLIT, CINAHL, Health Star, and the Cochrane Library from the beginning of each database to June 1998 with no language restrictions), citation tracking, and consultation with content experts. Study selection, data extraction, and assessment of methodological quality and clinical relevance were done by two independent reviewers. Discrepancies were resolved by consensus or by a third reviewer if necessary. Our attempts to mask the names of journals and authors turned out to be impractical, as reviewers were already familiar with many of the trials. Methodological quality was scored from 0 to 10 as recommended by the Back Review Group, even though blinding of care provider and patient might not be feasible with multidisciplinary rehabilitation.8 Clinical relevance was described by answering the following questions: are the patients described in enough detail to decide whether they are comparable to the readers' patients, is the intervention described well enough to allow readers to provide the same for their patients, and were clinically relevant outcomes measured? We calculated treatment effect sizes between groups and 95% confidence intervals for each randomised comparison for each outcome and follow up time. We calculated relative risks for dichotomous outcomes10 and standardised mean differences for continuous outcomes. If necessary, we approximated the numbers required for calculations from graphs and statistics in the article. When the standard deviation at follow up was not available, we used the standard deviation at baseline. If none was reported, we assumed the average standard deviation reported by other studies for that outcome. All analyses were conducted using Meta-View Rev-Man software version 3.1.1 (Cochrane Collaboration, 1998). Given the heterogeneity in study settings, interventions, and control groups, we decided not to pool effect sizes in a meta-analysis. Instead, we summarised findings by strength of evidence and nature of intervention and control treatments. 11 12 The evidence was judged to be strong when multiple high quality trials produced generally consistent findings. It was judged to be moderate when multiple low quality trials or one high quality and one or more low quality trials produced generally consistent findings. Evidence was considered to be limited when only one randomised controlled trial existed or if the findings of existing trials were inconsistent. We designated trials with methodological quality scores of 5 or more as high quality. 12 13 A trial was judged positive if it reported statistically significant benefits of multidisciplinary biopsychosocial rehabilitation compared with the control treatment, neutral if it did not report significant differences, and negative if it reported significant benefit of the control treatment compared with multidisciplinary rehabilitation. Our search identified 32 candidate randomised controlled trials. Twenty one failed to fulfil the criteria for review. One other trial did not allow the estimation of treatment effect for any outcome.14 Thus 10 studies were included in this review. The trials were performed in Scandinavian countries,15–24 Germany, 25 26 Australia, 27 28 and Canada. 29 30 A list of excluded studies is available from the authors. Table 2 summarises the methodological quality and clinical relevance of the trials. Most trials measured relevant outcomes and had an acceptable dropout rate and comparable timing of assessment. Four described adequate concealment of allocation. 16 27–29 None of the trials accomplished blinding of patient or care provider. Overall, the methodological quality score varied from 2 to 6 points. The Scandinavian trials were judged more clinically relevant than the others. What kinds of multidisciplinary treatments have been tested? 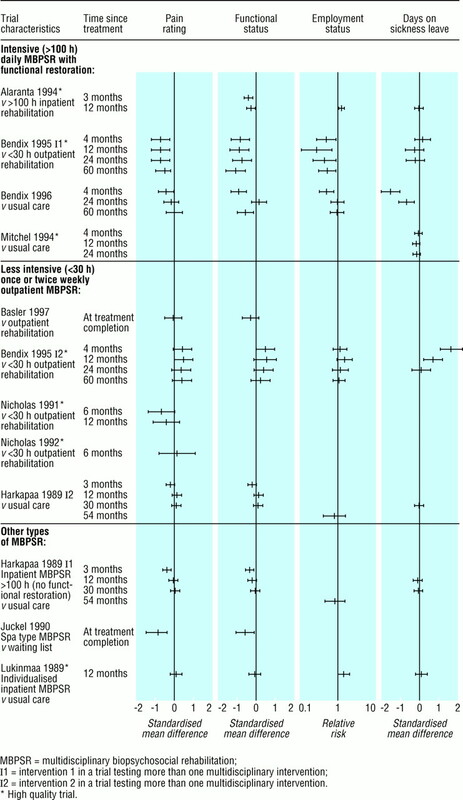 Most programmes had standard duration and interventions (Table 1). They allowed limited individualisation in the intensity of exercise and individual psychological or social or occupational counselling. Lukinmaa et al tested highly individualised multidisciplinary rehabilitation.16 Details of the content of multidisciplinary rehabilitation programmes are given in table A on the BMJ's website. Control participants received non-multidisciplinary inpatient or outpatient rehabilitation, usual care, or no treatment (waiting list). Two trials reported on the effect of less intensive outpatient multidisciplinary rehabilitation on quality of life, 27 28 and one reported improvement.27 Global assessments were reported in three trials.15 16 21 Table B on the BMJ's website shows details of crude outcomes. The human and financial costs of disabling low back pain are staggering—an estimated 1.7% of the gross national product of a developed country.32 Many different rehabilitation programmes of unclear efficacy are currently in use.2 This study provides a classification of multidisciplinary biopsychosocial rehabilitation and reviews 10 randomised controlled trials of such rehabilitation for chronic low back pain, which have not been included in previous systematic reviews.6 7 We were able to locate these trials because we did not impose any language or date restrictions and because our definition of multidisciplinary rehabilitation relied on the content of the intervention rather than its name (many trials did not use the term multidisciplinary biopsychosocial rehabilitation). The studies reviewed show that intensive multidisciplinary rehabilitation with a functional restoration approach decreased pain and improved function. Less intensive programmes were not better than control non-multidisciplinary treatments. Our findings must be interpreted in the light of the shortcomings of systematic reviews, in particular publication bias.33 Four other potential limitations need to be considered. Secondly, the cut-off point for a high quality randomised controlled trial was arbitrary. The cut-off point and the specific scale used to measure methodological quality can change the conclusions of meta-analyses.35 The scale and cut-off point used here are comparable to those of other recent systematic reviews on low back pain.12 13 If the cut off was set at 7 or more points, all the trials would be considered low quality and the strength of evidence would be moderate. Thirdly, some assumptions were made for calculation of treatment effect sizes (see methods section). In theory, these should not bias our estimates since the same assumptions applied to intervention and control groups. Calculation of treatment effect sizes allows meaningful comparisons across trials. Crude trial outcomes are available on the BMJ's website (table). Fourthly, the studies consisted of selected patients with severe disabling low back pain treated in well established multidisciplinary rehabilitation programmes. The results might not apply to most patients seen in primary care or to less established programmes. Should patients with chronic low back pain be referred for multidisciplinary treatment? Given the variability across multidisciplinary treatments, it is inappropriate to refer patients for multidisciplinary biopsychosocial rehabilitation without knowing the actual content of the programme. The reviewed trials provide evidence that intensive daily multidisciplinary rehabilitation with a functional restoration approach produces improvements in pain and function in patients with chronic disabling low back pain. Less intensive treatments did not seem to be effective. The reviewed studies provide evidence that intensive (>100 hours of therapy) multidisciplinary biopsychosocial rehabilitation with functional restoration produces greater improvements in pain and function for patients with disabling chronic low back pain than less intensive multidisciplinary or non-multidisciplinary rehabilitation or usual care. Whether the improvements are worth the expense of these intensive programmes is open for discussion. The final judgment will depend on societal resources, available alternatives, and the value attached to the observed decreases in human suffering from back pain. Contributors: JG contributed to the conception, design, and writing of the study protocol, helped to select and assess trials, conducted the data analysis, and drafted and approved the final manuscript. RE contributed to the conception, design, and writing of the study protocol, helped to select and assess trials, and revised and approved the final manuscript. KK contributed to the design and writing of the study protocol, helped to select and assess trials, and revised and approved the final manuscript. AM contributed to the design of the study protocol, helped to select and assess trials, and revised and approved the final manuscript. EI contributed to the design of search strategies and writing of the study protocol, located and obtained trial reports, and revised and approved the final manuscript. CB contributed to the conception and design of the study protocol, assembled and supervised the research team, and revised and approved the final manuscript. All the authors will act as guarantors for the paper. Funding JG received a research fellowship from the Institute for Work and Health, an independent, not-for-profit research organisation that receives support from the Ontario Workplace Safety and Insurance Board. KK's work was supported by a fellowship from the Finnish Office for Health Care Technology Assessment. RE is currently with the Calgary Regional Health Authority, Calgary, Canada.
. Relative importance of musculoskeletal disorders as a cause of chronic health problems, disability, and health care utilization: findings from the 1990 Ontario health survey [see comments]. J Rheumatol 1994; 21: 505–514.
. Types of pain treatment facilities and referral selection criteria. A review. Arch Fam Med 1995; 4: 58–66.
. Low back pain: a twentieth century health care enigma. Spine 1996; 21: 2820–2825.
. Towards a comprehensive assessment of chronic pain patients. Behav Res Ther 1987; 25: 237–249.
. Systematic reviews: synthesis of best evidence for clinical decisions [see comments]. Ann Intern Med 1997; 126: 376–380.
. Efficacy of multidisciplinary pain treatment centers: a meta-analytic review. Pain 1992; 49: 221–230.
. Does nonsurgical pain center treatment of chronic pain return patients to work? A review and meta-analysis of the literature [see comments]. Spine 1994; 19: 643–652.
. Method guidelines for systematic reviews in the Cochrane Collaboration Back Review Group for Spinal Disorders. Spine 1997; 22: 2323–2330.
. Multidisciplinary team approaches for the treatment of chronic low back pain. Cochrane Database Syst Rev 1998;(2):CD000963.
. Clinically useful measures of effect in binary analyses of randomized trials. J Clin Epidemiol 1994; 47: 881–889.
. Conservative treatment of acute and chronic nonspecific low back pain. A systematic review of randomized controlled trials of the most common interventions [see comments]. Spine 1997; 22: 2128–2156.
. Behavioural treatment for chronic low back pain. Cochrane Database Syst Rev 2000;(2):CD002014.
. Evaluation of an advanced back pain rehabilitation program. Spine 1984; 9: 317–318.
. Intensive physical and psychosocial training program for patients with chronic low back pain. A controlled clinical trial. Spine 1994; 19: 1339–1349.
. Low back pain as a biopsychosocial problem. A controlled clinical trial and a cost-effectiveness analysis. Kansanelakelaitoksen julkaisuja 1989;ML:90.
. Active treatment programs for patients with chronic low back pain: a prospective, randomized, observer-blinded study. Eur Spine J 1995; 4: 148–152.
. Multidisciplinary intensive treatment for chronic low back pain: a randomized, prospective study. Clev Clin J Med 1996; 63: 62–69.
. Comparison of three intensive programs for chronic low back pain patients: a prospective, randomized, observer-blinded study with one-year follow-up. Scand J Rehabil Med 1997; 29: 81–89.
. A prospective, randomized 5-year follow-up study of functional restoration in chronic low back pain patients. Eur Spine J 1998; 7: 111–119.
. A controlled study on the outcome of inpatient and outpatient treatment of low back pain. Part I. Pain, disability, compliance, and reported treatment benefits three months after treatment. Scand J Rehabil Med 1989; 21: 81–89.
. A controlled study on the outcome of inpatient and outpatient treatment of low back pain. Part III. Long-term follow-up of pain, disability, and compliance. Scand J Rehabil Med 1990; 22: 181–188.
. A controlled study on the outcome of inpatient and outpatient treatment of low back pain. Part II. Effects on physical measurements three months after treatment. Scand J Rehabil Med 1989; 21: 91–95.
. A controlled study on the outcome of inpatient and outpatient treatment of low back pain. Part IV. Long-term effects on physical measurements. Scand J Rehabil Med 1990; 22: 189–194.
. Incorporation of cognitive-behavioral treatment into the medical care of chronic low back patients: A controlled randomized study in German pain treatment centers. Patient Education & Counseling 1997; 31: 113–124.
. [Assessment of the effectiveness of inpatient rehabilitation measures in patients with chronic low back pain: a prospective, randomized, controlled study.] (In German.) Rehabilitation (Stuttg) 1990;29:129–33.
. Operant-behavioural and cognitive-behavioural treatment for chronic low back pain. Behav Res Ther 1991; 29: 225–238.
. Comparison of cognitive-behavioral group treatment and an alternative non-psychological treatment for chronic low back pain. Pain 1992; 48: 339–347.
. The functional restoration approach to the treatment of chronic pain in patients with soft tissue and back injuries. Spine 1994; 19: 633–642.
. A limited functional restoration program for injured workers: a randomized trial. J Occup Rehabil 1996; 6: 239–249.
. A prospective two-year study of functional restoration in industrial low back injury. An objective assessment procedure [correction appears in JAMA 1988;259:220]. JAMA 1987; 258: 1763–1767.
. A cost-of-illness study of back pain in the Netherlands. Pain 1995; 62: 233–240.
. The promise and problems of meta-analysis. N Engl J Med 1997; 337: 559–561.
. Outcome measures for low back pain research. A proposal for standardized use [correction appears in Spine 1999;24:418]. Spine 1998; 23: 2003–2013.
. The hazards of scoring the quality of clinical trials for meta-analysis. JAMA 1999; 282: 1054–1060.
. Indirect costs of back pain in the Netherlands: a comparison of the human capital method with the friction cost method. Pain 1999; 80: 201–207.